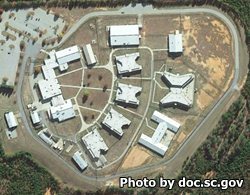 Leath Correctional Institution is a level 3 women's facility located in Greenwood South Carolina. Level 3 facilities are the equivalent of a maximum security prison. Leath Correctional Institution has a maximum capacity of 656 female inmates. Offenders at this facility are provided mental health services, and basic/routine medical and dental care at the facility. Offenders at Leath Correctional Institution can take educational courses to learn to read, and earn a GED. Leath also participates in the correctional industries program and employs inmates in a t-shirt manufacturing plant and an operation that produces braille textbooks. The Chaplains office at Leath Correctional Institution offers inmates counseling and twelve step programs like Alcoholics Anonymous. Furthermore, the chaplains office offers religious worship services, a choir, a grief workshop, parenting courses, and various craft classes. Leath Correctional Institution has a horticulture program that teaches inmates the basics of gardening and even cultivates various food crops which are then used in the prison kitchen. During an inmate's incarceration at Leath they can learn new skills in electrical, plumbing, painting, HVAC, tiling, sheetrock, and masonry. For more information on the programs available at Leath Correctional Institution read the official pamphlet. The visitation hours for Leath Correctional Institution are currently unknown. If you know the visiting hours for this institution please help us out by leaving a comment below.